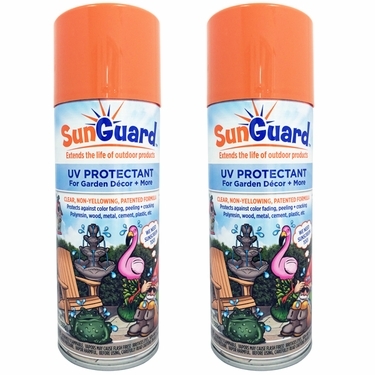 SunGuard UV Protectant is a clear, non-yellowing spray that protects all types of outdoor d�cor, garden art, fountains, furniture and garden accents against fading, peeling & cracking caused by the sun and harsh weather conditions! SunGuard UV Protectant spray will extend the life of all outdoor products made of polyresin, wood, metal, glass, cement, plastics, tile, wicker, dried/silk flowers, and other hard to bond surfaces. Also works great on figurines, garden statues, fountains, metal yard art, garden gnomes, wind chimes, garden stakes and more. Over 3 years in development, moisture resistant, smudge-proof patented formula. Made in the USA! Coverage: 25 square feet on non-porous surfaces. Dries to the touch in 15 minutes or less. Net Wt. 11.75 oz. For years people have been asking what's the best way to protect their outdoor products from fading. Until now we never had any good solutions to offer. The manufacturers would all explain to us the same story - that despite their attempts to use special UV protecting paints and lacquer coatings, within 3-4 months the incredibly powerful sun would break down that protection and nothing could really be done after that. A polyurethane was sometimes suggested, but it would yellow over time, and due its lack of flexibility, it was prone to cracking during temperature fluctuations. We scoured numerous DIY stores, hardware and garden centers trying to find a good solution but there was truly nothing.... until now! SunGuard UV Protectant spray is exactly what we've been looking for! This solutions-based product allows you to re-apply that original top-coat protection to help extend the life of all your outdoor products. This patented formula was specifically designed to protect against fading and peeling and cracking. And the best part is that you can use it on so many difference types of surfaces including wood, metal, glass, and even plastics and resins! We could never claim this to be stronger than the sun, but now you have the ability to renew that outer protective UV coating and feel confident that you have the strongest outdoor protection available on the market. You wouldn't go out into the blazing sun without sunscreen, would you? SunGuard UV Protectant spray is like sunscreen for all our garden products!